SAN DIEGO – Cisco this week is throwing its hat into the hyperconvergence and software-defined storage ring with a system co-developed with software company SpringPath. Cisco is also rolling out at its Cisco Partner Summit here a new generation of Nexus 9000 data center switches featuring 25G/50G Ethernet based on custom ASICs. The new products dovetail with Cisco’s acquisition today of CliQr, a maker of “application-defined” hybrid cloud orchestration software for deploying and managing applications across bare metal, virtualized and container environments. Those products include the HX Data Platform, the first offering in Cisco’s new HyperFlex systems portfolio (pictured). 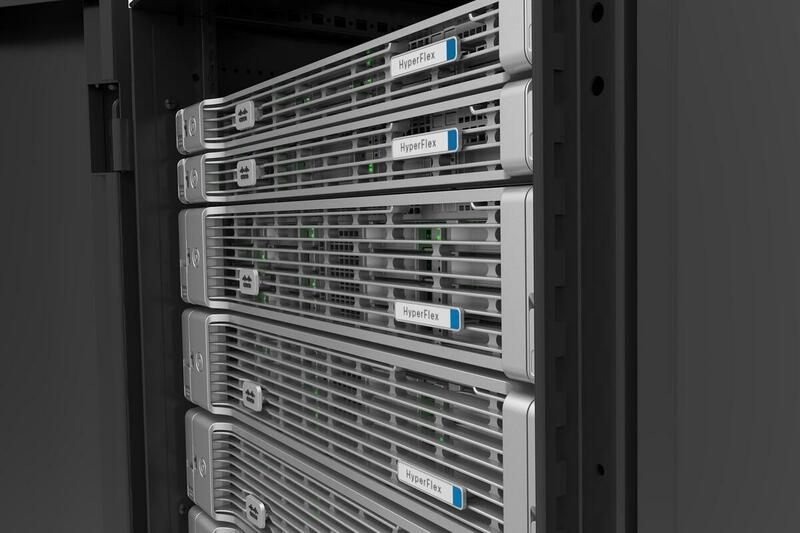 HX Data combines SpringPath software with Cisco UCS servers to form a distributed storage system using solid-state drives and spinning disks from federated server clusters. The intent is to provide data center administrators with a single distributed, multi-tier, object-based data store that converges network and compute, and fills what Cisco says are gaps in current offerings from start-ups and established vendors: scale, performance, optimization and integrated policy management. Cisco’s hyperconvergence offering was expected for some time and will compete with VMware’s EVO:RAIL system, and products from start-ups Nutanix, SimpliVity, Maxta, Scale Computing, ScaleIO (which was acquired by EMC), and LeftHand Networks (which was acquired by HP). Dell’s VRTX product is also considered a hyperconvergence solution. Cisco was rumored to be looking to acquire Nutanix, and it has an existing partnership with SimpliVity. Both companies also have relationships with data center server vendor Lenovo. But hyperconvergence solutions from start-ups have first generation limitations that limit the potential of the technology, Cisco claims. Those limitations include “inflexible and inefficient lock step scaling” of hyperconverged nodes; SDS stacks built on conventional write-in-place file systems, which hinder performance and data optimization; new silos of management and policies instead of integrating with existing tools; and separately integrated, instead of fully converged, networking. The HX Data product attempts to overcome these limitations by tightly melding Cisco networking, and security and compliance controls throughout the application lifecycle when distributing, migrating, and replicating data across storage environments. Compute and storage capacity can independently scale, Cisco says, allowing for resources to be added incrementally via HX nodes or UCS blades. HX Data and HyperFlex systems also enlist the Cisco fabric network to support parallel data distribution and replication for high availability and performance, Cisco says. Data is optimized through deduplication and compression, and dynamic placement in server memory, caching, and capacity tiers not only supports redundancy but lowers storage cost, the company says. HyperFlex systems can be managed by existing UCS management and automation tools, and data services are managed through hypervisor tools like VMware’s vCenter. Cisco says this helps facilitate the transition to a DevOps IT model. HX Data and HyperFlex systems are also extensible to support a range of hypervisors, bare metal and containerized environments in the future, Cisco says. HyperFlex will also be included in Cisco’s Application Centric Infrastructure SDN, and hybrid cloud and multi-cloud orchestration. Future support for ACI will result in an SDN that provides automated, policy-based network deployment that provides microsegmentation and multitenancy, Cisco says. An HX Data starter bundle starts at $59,000. It will ship later this month. In data center switching, Cisco rolled out the new Nexus 9200, a system based on Cisco ASIC technology that enables customers to transition from 10/40G Ethernet switching to 10/25/40/50/100G at the price of 10/40G. Cisco says this is possible due to the use of 16nm technology that enables 36 ports of line rate 100G on a single chip, and scales from 100Mbps to 100G on the same port. The switches, which are targeted at multiple, large-scale cloud networks needing hyperconverged fabrics, are also designed to provide pervasive visibility into flow tables at both the leaf and spine; 140K micro segments per rack for security, and support for over a million containers per rack; and adaptive capacity and congestion control for dynamic load balancing and lossless operation. The Nexus 9200 and 9300EX are fixed configuration top-of-rack switches that can both run in standalone NX-OS mode, while the 9300EX can also run in ACI fabric mode. Cisco also rolled out a line card for the modular Nexus 9500 chassis that supports 32 40/100G ports using the new custom ASIC, and can run in either NX-OS or ACI mode. The Nexus 9200 and 9300EX switches are list priced at $20,000 and $22,500, respectively. The 9200 is shipping now, while the 9300EX will ship in the second quarter. Cisco also expanded its Nexus 3000 line of merchant silicon-based fixed configuration switches with platforms based on Broadcom’s Tomahawk 25/50/100G chip, and Trident 2+ ASIC. Cisco also unveiled a 32-port 40/100G line card for the Nexus 9500 chassis based on the Broadcom Tomahawk ASIC. The new Nexus 3000s are shipping now. Lastly, Cisco expanded its ACI and NX-OS data center switching software to include ACI APIC controller and fabric support for older Nexus 7000 switches and ASR 9000 routers; and hyperconvergence, DevOps automation, segment routing and in-service software upgrade support in NX-OS. Cisco also unveiled Nexus Fabric Manager, software for automating the configuration and management of VXLAN-based fabrics through zero touch provisioning and a handful of mouse clicks. APIC on Nexus 7000 and ASR 9000 will be available in the third quarter. Nexus Fabric Manager and the enhanced NX-OS are shipping now.